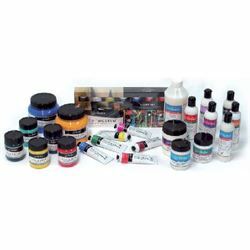 Atelier Interactive is the most versatile acrylic paint on the market. It handles like a conventional acrylic making it a popular choice for Fast Drying Techniques, but it has other exclusive abilities if you want to use them. Atelier Interactive is the world’s only acrylic paint that gives you a new option; Controlled Drying Techniques. You can control the paint's open time for as long as you want using a fine mist of water or moist brush; blending layers of Atelier Interactive is easier and far smoother than with any other acrylic. When you want to return to Fast Drying Techniques, simply withhold water and it will dry rapidly again. It’s that easy - and only possible with Atelier Interactive’s unique patented formula. There is another unique benefit: Atelier Interactive allows you to re-activate touch-dry paint using Atelier Unlocking Formula, to return to wet-in-wet blending. A true revolution in acrylic paint technology!